Large breed dogs are the best. Whether it is because they are able to actually intimidate and scare off would-be home invaders or just because there is so much more dog to love, larger breeds represent some of the greatest family pets (or security systems) in the world. Of course, there is always the concern that your large breed pet can quickly outgrow their frame in the weight department. Many large breeds come with concerns of joint and back problems or hip dysplasia and these conditions can be worsened by the animal being overweight. Because we love our big furry friends, we have put together a list of the top 5 weight management dog foods for large breeds. If you are looking to keep your pet healthier longer, consider whether you need to make the change to keep your dog at an ideal weight for their breed. As always, consult your vet before you switch foods and always do so gradually so their digestive system can adjust to the change in food. Purina has always been one of the most popular names in pet food manufacturing. It would only make sense they would have a contribution to some of the best weight management dog foods on the market. 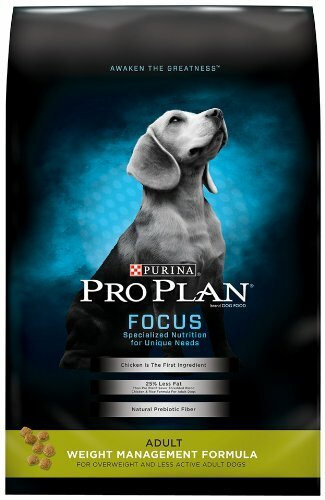 The Pro Plan weight management dog food contains 25% less fat than their regular chicken and rice formula, but maintains chicken as their number one ingredient. 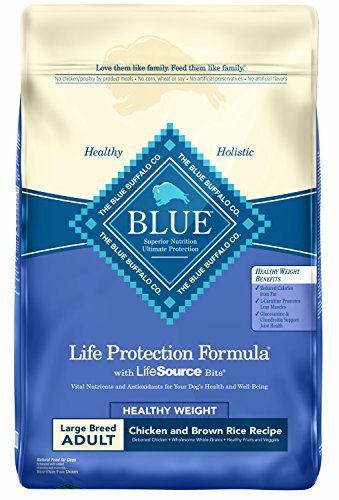 Blue Buffalo is one of the highest quality names in dog foods and their healthy weight life protection formulated dog food is engineered to keep your pup lean and mean. Featuring deboned chicken as the primary ingredient, Blue Buffalo mixes that with brown rice rather than white in addition to garden veggies, whole grains, and fruit to ensure your pet isn’t stuffed with filler ingredients and is only getting the healthiest meals you can find. Featuring not just chicken proteins like our previous two entries, Nutro brings a more diverse protein palate to your puppy’s bowl. Made with chicken, salmon, and lamb proteins, Nutro focuses on giving our large breed animals the nutrients they need without the fillers they don’t. 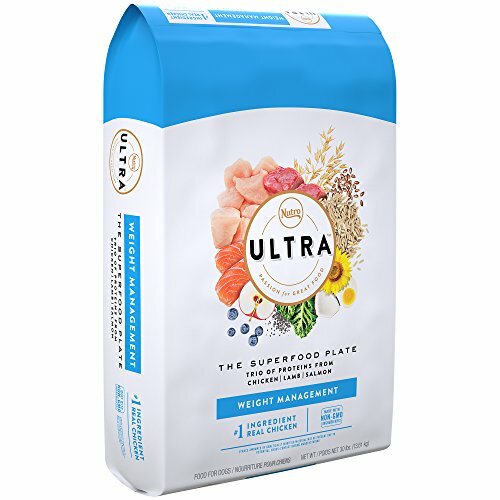 In addition to the protein trio Nutro features, they also blend those proteins with a unique mix of superfoods. Included in the list are coconut, blueberries, chia, kale, and more. As a side warning, because of the diverse mix of additional fruits and vegetables, please be aware of whether your dog may have any food allergy concerns so they don’t get out of control. 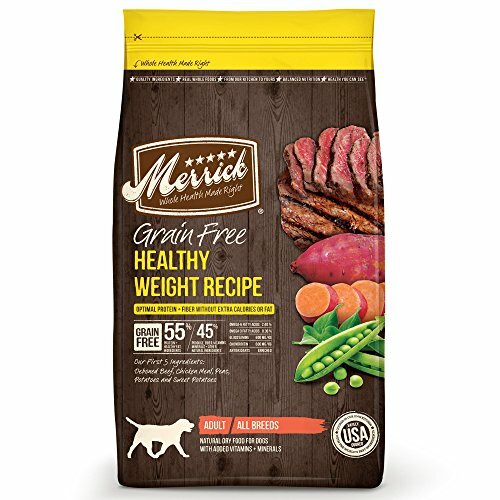 Merrick is our fourth entry on our top 5 weight management dog foods for larger breeds. Featuring gluten-free ingredients, Merrick brings a completely grain free diet to your dog’s system. 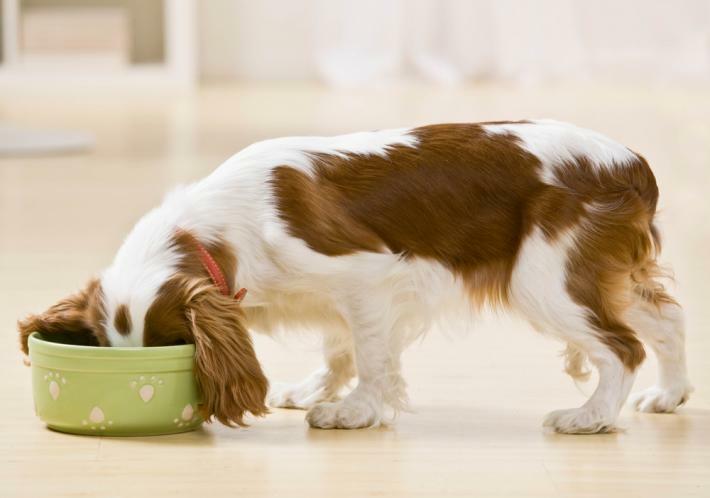 One of the down sides of grain based foods is they can be more difficult for your pet to digest, and a gluten free meal is far less likely to pack on the pounds than one rooted in wheat and rice. With measurable levels of Omega 3 and 6 fatty acids, in addition to trimming some extra weight your pet will also see healthier skin and a shinier coat and like the Blue Buffalo formula mentioned before also includes that glucosamine and chondroitin supplement to keep your pet active and mobile longer. Wellness Core is made right here in the USA and brings some of the most specialized care to your pet’s digestive systems. Featuring 41% of its ingredients from high protein sources such as turkey, chicken, and salmon oil, you can rest assured your dog is getting the muscle retaining protein they need while avoiding those fillers and grains like corn and soybeans. If your goal is to help your furry friend maintain a healthy weight, any of these foods would be a great choice. Again, we encourage you to always be aware of food allergies and if you experience any complications to reach out to your vet and make sure there isn’t a problem with the food you are transitioning over to. 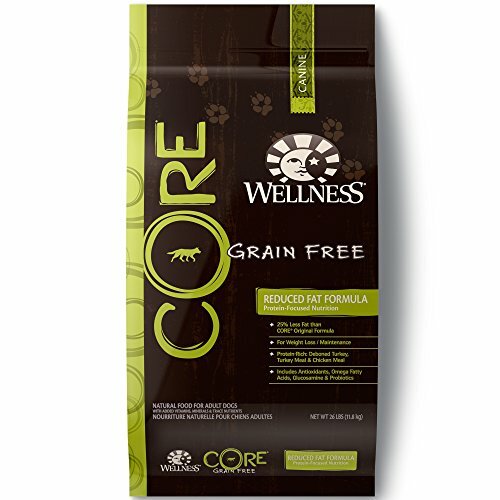 Barring any concerns there, dollar for dollar, we stand behind Wellness Core’s natural, grain free dog food to keep our pets slim, trim, and around for as long as possible.